The Zoopla estimate is our assessment of the market value of a home on any given day, calculated using a proprietary algorithm which analyses property data points on all 29 million UK homes on a continuous basis. We get our data from multiple sources including the government (Land Registry & Registers of Scotland), estate agents, surveyors and our users. Our model looks at the relationships between transaction prices and property characteristics (type, style, tenure, number of bedrooms, etc.) and uses these patterns and trends to estimate present values. 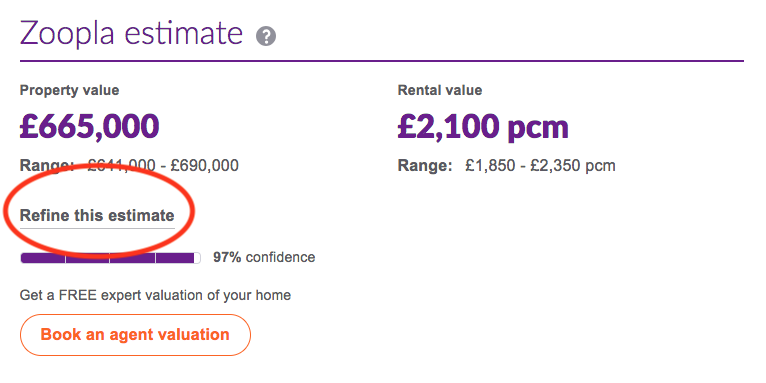 If you believe that the Zoopla estimate for your or any other property is incorrect, we encourage you to help us to improve its accuracy by selecting the 'Refine estimate' link for the relevant property, providing additional details and letting us know if you don't agree with the estimate via our 'Estimate Feedback' form.